I am so grateful this man lived and created such wonders for so many to enjoy and cherish. And I love the photo below. It's from the cover of Tom Shippey's fine Author of the Century. The mood, the look of the sea, the time of day -- this is very much the way I picture the end of "The Grey Havens", Sam standing on the shore, looking long at the grey shifting sea over which Frodo has gone. What Tolkien wrote, even if categorized 'Fantasy', always had the ring of 'been there, done that', from the external settings to the deepest experiences of the characters. He'd stood by the sea, he'd known irreparable loss. And turned it into unforgettable art. Jan-u-wine, inspired by the photograph below, has written a beautiful tribute to the Professor for his birthday. It is posted below the image. of a Ring-bearer's Sea Bell. Ohhhhh. This photo and poem are perfection for this very special day. Hi! I'm back from work. I am sooooo glad the things in the post pleased you, Shirebound. Huzzah for J. R. R. T.! Thank you so much, Rakshi. :) Sorry to be so long answering, I was at work. What Tolkien wrote, even if categorized 'Fantasy', always had the ring of 'been there, done that', from the external settings to the deepest experiences of the characters. CS Lewis wrote in his review of The Hobbit that everything in it seems so 'ripe and friendly and so true'. We seem to know, or recognise, this world we've fallen into, somehow. This world of bucolic villages, desolate moors, misty mountains and mysterious ruins. Middle-earth seems extraordinarily familiar ... created as it was from Tolkien's rich treasury of knowledge of ancient British and European mythology. He'd stood by the sea, he'd known irreparable loss. And turned it into unforgettable art. We seem to know, or recognise, this world we've fallen into, somehow. Isn't that precisely the case? Hi, Pearl. I've been at work and am only now reading your comment. You know this material and its author so well (and his literary friends), I know this day is meaningful for you, too. *clink* I raise my glass along with you, Belleferret! What a wonderful birthday post! Cheers, Julchen! I love this day of the year. You are welcome, Mews. I just got home from work but am off again. How lovely to come home to your comment. I am so grateful to Tolkien, even if I write these little posts each year, I really can't express it. Thanks, Mariole. Glad you enjoyed it! What a wonderful phrase. Perfect. Thank you and Jan for the lovely post. I did toast him at 9 pm with the water bottle I had on hand. Happy birthday, Professor, and thank you! Ha ha! I had an email from Jan this morning, saying she was all in after attending the L.A. area toast. I just watched a Harry Potter movie with our daughter, who is home for six days. (She didn't want to watch any LOTR, sigh.) I completely forgot to toast! Just a small part of so much beauty. 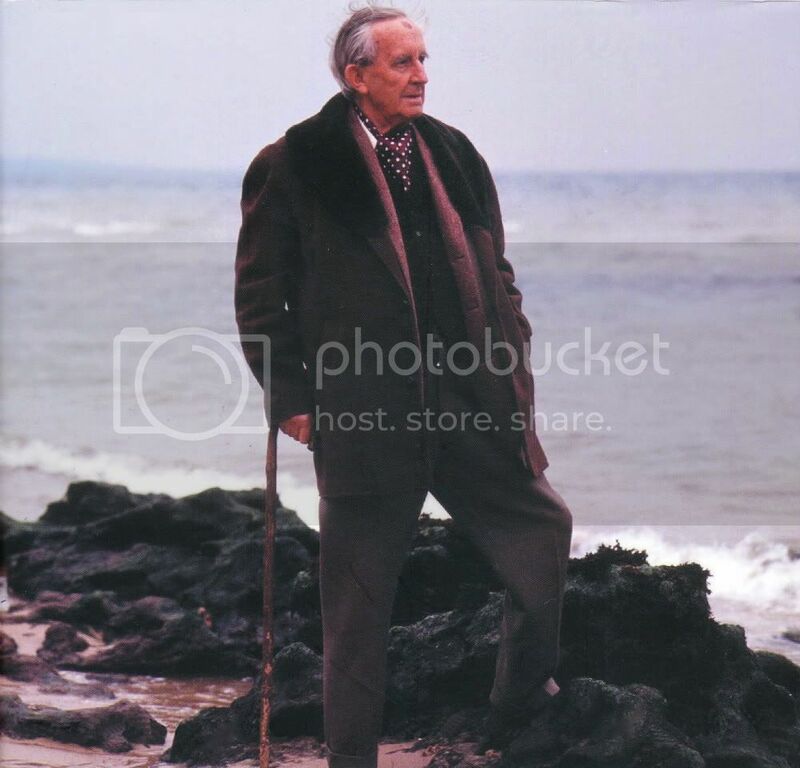 Its a lovely pensive sort of peice that fits this picture and the pensive look that is Tolkien at that moment. I love the sea. There is nothing more majestic to me than the smell, sight, feel or sound of the ocean. It is powerful and in Tolkien's world has the power to seperate elves, a wizard, men, and mostly two hearts forever joined in friendship and love in our beautiful little hobbits. What a mind, heart and soul. Verangel, I am so glad you enjoyed the post. Tolkien certainly appreciated the Sea, its beauty, its power and the pull it exerts on the human mind and spirit. I see you share it. “to pluck, with fragile deliberation, a single, storied shell from the sun-gilded Sea”. And what a gift he left behind. Thank you both for this wonderful tribute to a great man. Oh, my dear jan-u-wine, this is just too beautiful! Love it so much. What a marvelous tribute to the Professor who has touched so many lives. Love the picture you used, dear mechtild, too! That could indeed be Sam there and so wonderful it inspired such a masterpiece as this poem! I'm so glad you enjoyed the birthday post this year, Antane. I love what jan-u-wine wrote. What a gift Tolkien has given to us, his world and work. Did you do a Tolkien toast where you live? There's no such thing here in Duluth, but jan-u-wine attended the L.A. one.